So a lot has happened in the past couple weeks. I ran a camp. I got my haircut. The celebrity blogging world picked up on my niche. But I’ve not done much chnepring. I’ve been trying to write one of those raconteurous, bloated, all-encapsulating, allusion-filled anecdotes for, uh, like the past three months. I’ve got a couple drafts, a few half-finished stories, and three pages of meandering prose with lots of paragraphs but very little punctuation. Whilst my oft-imitated numbers list was fun, I know my faithful readers need a real update. Tha majority of my hits are people doing a GIS for Mackerel. Two of my friends were hired by the firm and arrived in February, henceforth to be known as Buckshot and Raleigh. Buckshot I met in summer 2003 while doing an internship at a restaurant on Park Avenue. He’s from New Orleans, and while I was working, he was taking classes and screwing off. However, we did talk food a whole lot. And we did some drugs. We lost touch for a little bit, but found each other again through a mutual friend and the wondrousness of the facebook. Raleigh is South African. We met in 1999. I was still in high school, but taking a restaurant management course at the local community college. I’m still not quite sure how he ended up at a community college in The Hem, but we became friends nonetheless. We had also lost touch for a number of years, but when I moved to The Dark Continent, I dropped him a line. He was managing a boutique hotel in Stellebosch. Crazy? Well I left Vegas for this place. . .
Basically, all the hot girls I tried to get hired weren’t interested. Needless to say, we’ve been had a hell of a time. We all found comon ground on a new found love of karaoke and tore it up at the local Juba Pizza spot every friday. Buckshot had a little trouble adjusting, but is now rockin and rollin. He ended up being put in charge of a camp that houses many people from a large international organization. He did some party promoting back in Nawlins and has since turned that camp into Studio 54 Juba. It’s pretty ridiculous. Raleigh picked up the hotel and ran with it. He’s really been kicking the place up a notch. Pepper grinders and stuff. The first two weeks with the three of us all at one camp was like a think tank. We were coming up with ideas every night, making cocktails, making new dishes. It really jump started me, giving me the energy that i needed to keep running. I’d seen neither of these dudes since some time in 2004ish. And all of a sudden we all meet up in Sudan. If you woulda told me this woulda happen back then, I’d’ve bet against it. Oh. And about month after they arrived, I turned 25. I got the car insurance break and I don’t even have car insurance to notice it. Or a car. But we had green beer for St. Paddy’s. A Juba first, I’m sure. And sambuca was lit on fire. Glasses were stuck to bums, spoon fights were had, the finest white women in Juba showed up, a fight nearly broke out, and someone who shall remain nameless vomited. It was everything a birthday should be. Not only was it spectacular celebrating a quarter century of life on the banks of the White Nile, but it was the first birthday I’d celebrated internationally since I turned eight in Goteburg. It wasn’t a big bash cause I’m not big on birthdays. See, I’m usually the center of attention anyway, so what’s one day? I’m just always impressed that I made it another year without snuffing it. As for me, I’ve realized march inventory usage faster than it has ever been before. Hoo hah. Now it’s just another month till I get an entire month paid leave. Double hoo hah. But last thursday I left Juba. And now I am running a camp in Rumbek, where my Sudanese adventure began late last year. And now things are changing. Well, I guess they always were. I am kinda going day by day on this I don’t know where I’m going in a month. I don’t know what will happen tomorrow. There’s certainly a comforting freedom in such uncertainty. CHNEPR has become a place where I proclaim thing about which I am proud, and sometimes things about which I am ignoble. Sometimes such proclamations fall under both. What’s so special? 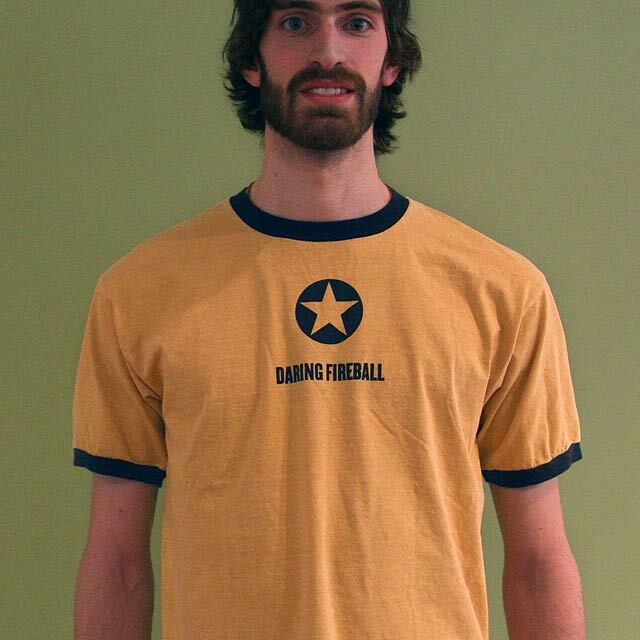 Wellllll, it’s a limited run of 75 shirts—I am a T-shirt afficionado—and it comes with year long membership to Daring Fireball. Not only is Gruber one of the most popular people on Twitter, but he’s a damn good writer, and web designer. And a mac user to boot. With a subscription, I get full, unbridled access to customized RSS feeds. So why am I compunctious? Aren’t I a self professed geek? I’ve spent more on a bottle of wine. I’ve spent more on lap dances in a 6-song window of time. Thing is; this afternoon a groundskeeper came into the office, hoping for a weekly bonus. He always smiles, says, “morning,’ when he’s sweeping, or cleaning or wiping, no matter the hour of the day. I don’t think he understood that bonuses are based on merit and are fairly subjective, certainly not earned every week. It was then I realized that this shirt cost me little bit more than the amount the seven groundskeepers collectively earned today. At least it will look better on me than the dude in the picture. You are currently browsing the Cheetahs Nevah Prospah blog archives for April, 2007.